Individually the Historic Court Buildings on Federal Street are noteworthy examples of architectural styles that were commonly employed in public building design from the mid-19th to the mid 20th century. As an assemblage, are truly extraordinary. They were added to the Most Endangered List in 2007 when the program for the new Ruane Judicial Center included vacating the historic buildings. 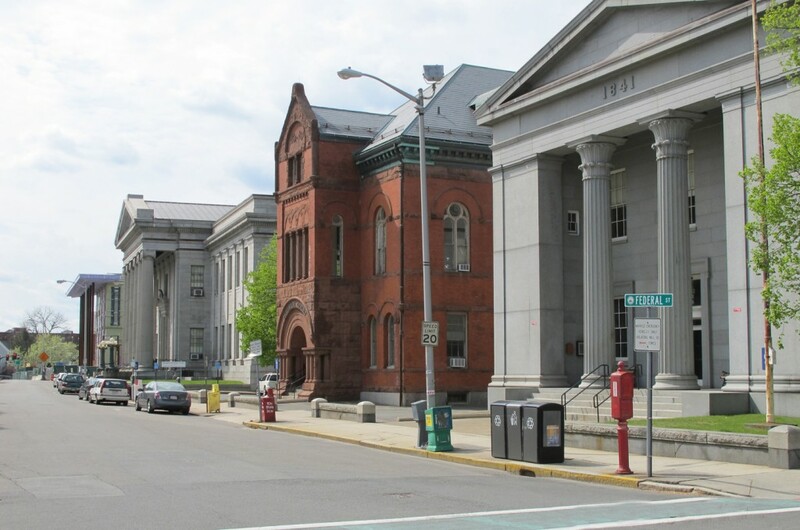 Proposed plans for the Superior Court and County Commissioner’s Building are currently at a standstill, awaiting needed legislation that will move them from State ownership to local control through the Salem Redevelopment Authority. You can read Historic Salem's support letter for HB 2524 here. The Registry of Deeds is being re-used as the Family and Probate Court. The Division of Capital Asset Management (DCAM) hired Perry Dean Rogers | Partners Architects, an architecture firm in Boston, to conduct a certifiable building study for the Registry of Deeds. Following this study, the state allocated $60 million for the renovation of this property. You can see the beautiful results when you walk down Federal Street. The project was awarded a Historic Salem Preservation Award in 2017. The entire block that comprises the Courthouse District is in the Federal Street National Register Historic District. Aligned in a row on the north side of Federal Street, the three Essex County courthouse buildings form a visually exciting and historically significant streets-cape. Individually, the buildings are noteworthy examples of architectural styles that were commonly employed in public building design from the mid-19th to the mid 20th century. The assemblage is extraordinary. The Superior Court was initially constructed in an Italian Revival style structure in 1862, then was remodeled between 1887 and 1889 in the Richardsonian Romanesque style. The interiors of the Superior Court Building are of particular architectural significance. Of these, the Law Library is of the very highest quality and rarity. The 1841 County Commissioner’s building one of the most outstanding Greek Revival style civic buildings surviving in New England. However the majority of the historic fabric in the interior of the Commissioner’s Building has been removed or irrevocably altered. The 1909 Essex County Registry of Deeds is considered by Bryant Tolles to be “one of the finest Neoclassical Revival buildings in the Boston area.” The granite edifice, designed by Clarence Blackall of Boston is notable for the six-column Greek Ionic portico at the front of the building. As described in the history of the courthouse efforts, original plans in 2003 included the reuse the historic court buildings on Federal Street for ancillary uses to the new courthouse. By 2007, the plans had changed considerably. What was proposed would mean that two of the three historic courthouses on the street would be vacated, declared surplus property and “warm mothballed.” Without a clear plan and schedule for their reuse as civic buildings, Historic Salem, Inc. feared that these magnificent public buildings might lie dormant and neglected for a period of time after being vacated with the additional risk of losing them to private, rather than public, use. Advocacy efforts for these buildings are on-going.